The text is still a work in progress, but you get the idea of what to expect. Will this will come to all applicable clients in time? I only ask, as I mentioned it here the other day. Api info is being published, yes. This information can be used by the server dashboard, by remote control apps, and also inside of video player OSD's. 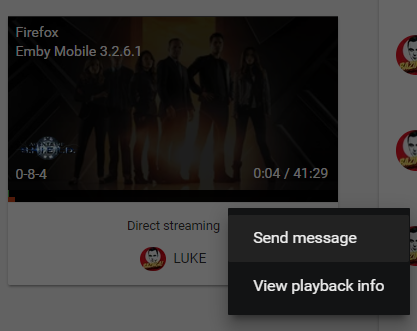 This is going to be replaced with a 3-dot menu in order to accommodate the send message function, which finally will return @Vidman. For now it is just a text prompt. It won't have all the options of @chef's plugin, like modal/non-modal, timeout, etc. It is definitely more handy to have those options in the UI, without having to browse through plugins! Nice! In 3.2.20.16, is it expected that nothing happens when clicking on the info icon? Actually I'm going to do this for now. We can keep the buttons directly on the card as long as we can. if we start adding a lot more features then we'll have to tuck them behind a menu button. 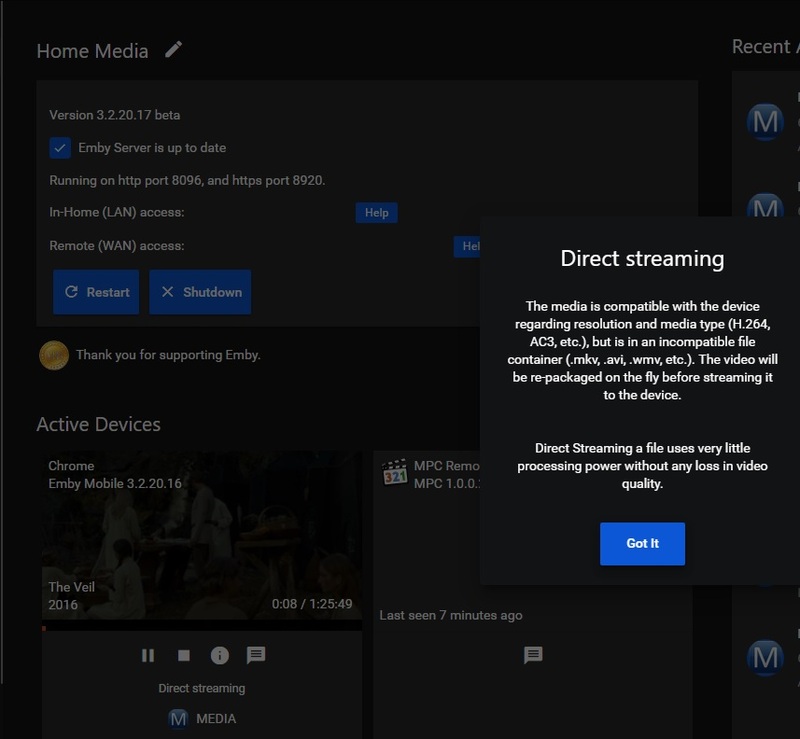 So why does that say Direct Streaming when it's transcoding? It is direct streaming. Click the info button to learn more. Unfortunately what's going to happen now is people who have never discovered the normal remote control features are going to complain asking why we only support pause and stop. Hmm, I don't see these options at all, and I have tried removing all custom css. This info icon does nothing at all in any browser. Or is this something still in the works and not released? Edited by Happy2Play, 29 June 2017 - 03:23 PM. This info icon does nothing at all in any browser. I asked that the other day as well. Looks like Happy is, as am I. You must mean .17 that just came out. Edited by Happy2Play, 29 June 2017 - 04:33 PM. Just got 17, but still no i in the (mobile) dashboard. I have the other controls. Can't speak for mobile devices but I see the same option as in post 8, in .17, now. 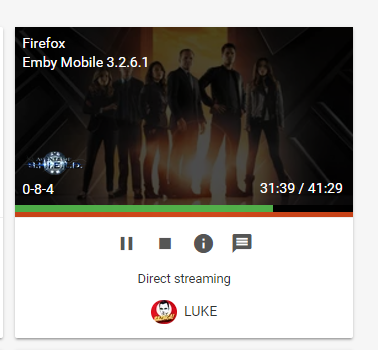 So Emby considers Direct Streaming if only one of the two streams are converted? Is this technically still transcoding even if it is only one stream? Or does transcoding only apply when we are talking about the Video stream? *Minor bug the version in active devices toogles between .17 and .16. Edited by Happy2Play, 29 June 2017 - 04:48 PM.